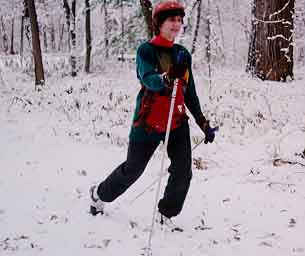 The diagonal stride is the equivalent of walking in cross country skiing. One leg, the lead leg is thrust forward and weighted. The trailing leg is lifted and brought forward to become weighted and become the new lead leg. 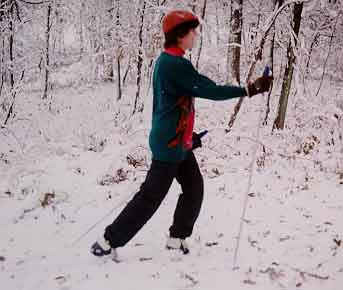 The arms swing in a natural forward and backward motion with the poles engaging in the snow to propell the body. The skier glides over the snow with efficiency. The left leg and right hand are forward at the same time and vice versa, hence the name diagonal stride.